GX Skate was a new line of skateboard-based toys for Jakks Pacific. Our first task was to breakdown all skateboard art into 8 major categories and name them. 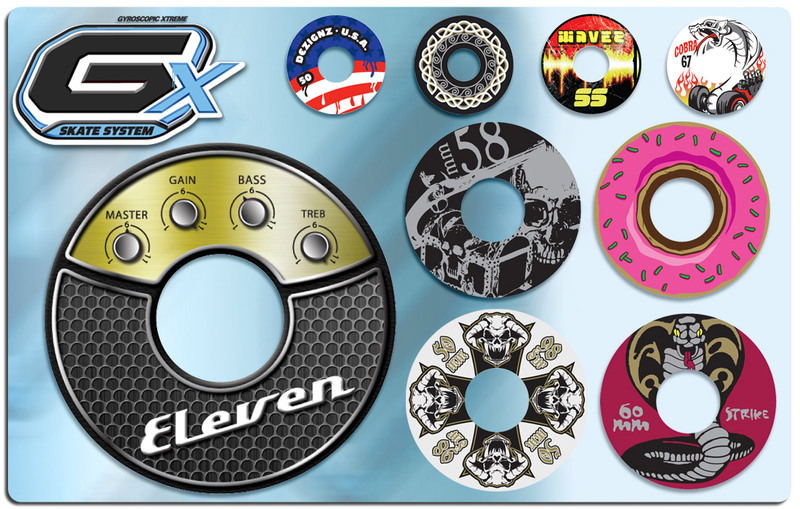 Once that was complete we went on to design over 50 wheels for the product line. We love our jobs whether we’re working on pet toys, typing tutorials, set design or corporate videos. But having experienced the Dogtown days first-hand, skateboarding is something we hold especially dear to our hearts. So when Jakks Pacific came to us with a skateboard-based toy, we were stoked. The idea was that the wheels would be different and collectible while the gyroscopic action still made them fun to play with. We were able to use our skateboard expertise to categorize, name and design wheels. Can you believe we still had some of our old skateboard magazines laying around to use for reference? And because of our extensive background with paint and tampos, we were able to create designs that required fewer “hits” which saves money per piece and helps the bottom line. Do you have an idea for a product but need designs for variations? Let us help. Call us to discuss your specific needs and let our team of experts go to work for you. We are adept at minimizing production costs while still putting out an amazing product in an amazing package. We will work with you to make your product the best that it can be while still staying within or even under budget. We’ll do the dirty work so you can look like a star. And who doesn’t want to look like a star?